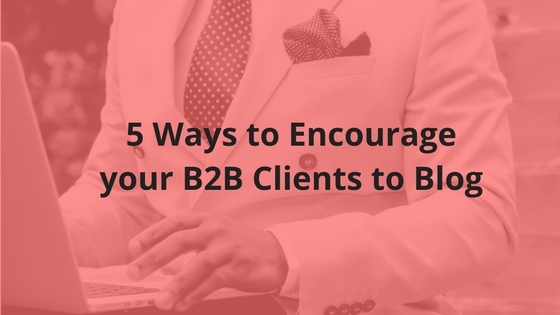 Not all B2B clients are created equal. Some are skeptical about handing you the pen and writing for their business blog. Others would totally ditch the idea – especially small business owners who battle for time. Whether you will be tasked to do the actual B2B blogging work, or be simply the one to nudge the client to get down to writing – here are 5 effective ways to encourage your B2B clients to blog. Sometimes, it just takes a little push and initiative to get them interested and appreciate the results of B2B marketing strategies. This is the sure fire way of getting their attention. In a simple email, show them what their competitors are blogging about: expert tips, insights, thought leadership, and even social media participation. If they do have a quiet space, research on related brands that have proven success in their B2B blogs. Select impressive content marketing pegs that they can actually copy. Make sure it is feasible from their end so it doesn’t appear intimidating to them. Take the first initiative and draft the content calendar. If you can demonstrate how the big picture plays out into the little details, they’ll be confident that you can do the job. Especially if they’re hesitant to let you write the content for them, by showing them you can come up with an awesome, well-researched content calendar that appeals to their audience – you could get additional pay for that! This also assures your B2B clients that since you have a stock of blog posts in your disposal, the B2B blogging project will have continuity. The last thing they want is to launch something, and then abruptly stop the initiative. Whether they’ll be the one to write the blog posts or you, it’s highly important you hear out each other’s feedback. Take their opinions into consideration. If you think it’s a bad idea, explain clearly and politely. Giving and hearing feedback in general, improves any relationship. It also ensures you are working to make things better in your B2B blogging work. Not just for milestone results, I’m encouraging you to communicate every quick-win you get out of your B2B blogging for clients. Show them readers’ sentiments; how many subscribed to their blog; or even the shares they got. This should be easy if you’re tracking your content metrics. You can also set this as a custom dashboard report to your B2B clients so they can see first hand the results of each blog post written. Asking about your client’s year-round plans will help you create a more cohesive and integrated content marketing strategy. This also shows your genuine interest to help your client’s business. Find out about their marketing plans monthly or quarterly, then integrate these into your B2B blogging calendar. If they’re launching specific seasonal campaigns, tie it up with content. An example would be a free digital gift (like an ebook) during holiday season. One last TIP: Include them and other industry leaders in an expert roundup post. One thing I’ve known for sure, B2B clients love being tagged alongside the experts! If they are the industry experts, as well, then that’s a double-win! 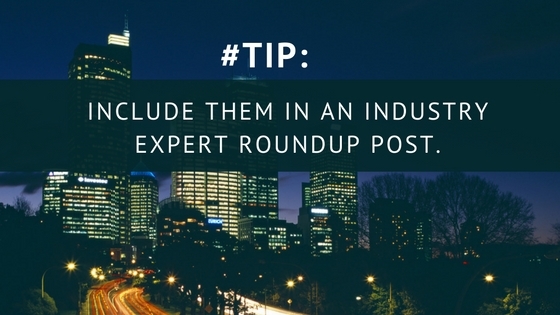 Come up with an interesting expert roundup post that is relevant to their industry. Reach out (but build relationships, first!) to the influencers, well-known brand executives, CEOs, etc and ask for a piece of advice or take regarding the topic. To make sure you get quality insights, be very clear and specific in your question. Ask a common question to all and allow them to expound. In exchange, make sure you feature their bio and a link back to their website. Remember, the more people to participate in the roundup post, the better. It makes your post really informative and to-beat! I’ve proven this works best if you have an existing partnership with brands. It’s so easy to start a conversation without being too pushy. If you don’t have one, try researching for past interviews and press releases published on the web. Pick out their quotes (make sure to credit the source). Be selective in gathering interview snippets to make sure it’s relevant to your topic. Once done, send an email, tweet, or any method to reach out to these influencers/partner brands and tell them you’ve featured their advice. Encourage to share the roundup post. The influx of traffic to your roundup post depends highly on quality of write up, the number of experts in the roundup, as well as how well you market the post. Outreach like crazy! If you need me to create a roundup post or content strategy for your B2B blog or for a specific B2B client, send me an email at: mail@romeladeleon.com or contact me here. To your B2B blogging and marketing success!